If you're like me, you already know that taste, seasonality, and warmth are great reasons to make more soups for your meals. But there are a few other reasons that soups are one of the best things that you can do with veggies and why you might want to try adding a few more soups into your kitchen routine! #1. Soups help you eat more veggies! Why? Because if you haven't noticed, you can cram a whole lotta veggies into a soup. If you’re looking for ways to eat more veggies, soups are your ticket this time of year! When you cook veggies into a soup you can fit WAY more than you’d think! And then they taste so good that you're often going back for seconds of what is basically veggies! #2. Soups are easy if you're busy or working! Why? Because, you can make them ahead and reheat for dinner quickly when you walk into the house after running around with the kids or home from work. And this is all done without any loss of delicious taste! What?? Well, you know the saying, “Soups are better the next day”? Well, that is totally true! So it's a win-win! 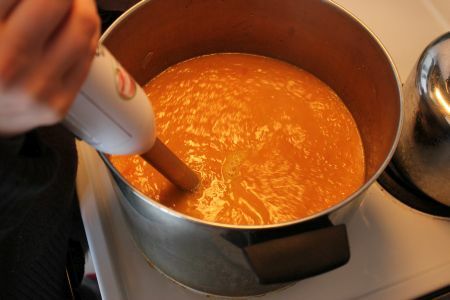 Making soups ahead of time is a super good idea in terms of taste AND busy dinner time schedules! Permission granted, friends. And if you’re trying to save time in the kitchen, then big-batching a big pot of soup is an awesome way to have a warming tasty meal that can be easily reheated for the whole week or that can be put it in the freezer. #3. Soups help you use up extra veggies, preventing waste! Got any extra veggies that are sitting in your fridge threatening to be composted if you don’t use them up soon? Throw them in a soup! Most of the recipes below are flexible and can be used with many kinds of veggies! Here are our very favorite pureed veggie soups perfect for fall and winter weather. If you're adventuresome, also check out my blog post: Formula For A Creamy Vegetable Soup That Will Get Compliments Every Time. I love the texture that beans add to a chili or that lentils add to a veggie soup. They really bulk it up by adding protein and make it a whole meal into itself. Here's my go-to lentil veggie soup recipe. Love it! Have you gotten your deer yet? Or filled your freezer with part of a beef cow? ;) If so, this one is for you! Sometimes combining meat with veggies can make everything taste so much better that you can’t stop eating it! I know that was certainly true of this recipe that I got from my friend who raises beef. I recently made it and it is so good that it has the potential to become a family staple at our house! And feel free to adjust the veggies to what you have in your fridge that needs to be used up! Brown beef with onions and cumin in oil. Add stock, water, minced garlic, salt, pepper, and half the cilantro. Bring to a boil, reduce heat and simmer 30-90 minutes, depending upon toughness of beef. Add remaining chopped cilantro just before removing from heat. Ladle soup into bowls, garnish with cilantro sprigs and (optional) avocado, and serve with flour/corn tortillas or chips. Let those fresh veggie flavors delight your family and guests! Leave out the beef and use veggie broth instead for a vegetarian version! Are you already a soup lover? What is your favorite soup for fall? Please reply and let me know! I'm always looking for more soup ideas!